For most of Diepenbrock’s songs the reason or incentive for composing them is documented. But that’s not the case with La lune blanche (The White Moon). It is not mentioned anywhere in his surviving correspondence. Diepenbrock notated this short, strophic song (one of the very few of his songs that are not through-composed) in a hurried scrawl, which is often difficult to decipher, on a loose page with the following dedication: For Toon / 19 Nov 1898 / from Fons. Amongst the works which Diepenbrock had lately composed were his first songs set to French words: Écoutez la chanson bien douce (Hear the Sweetest Song, RC 40) and Clair de lune (Moonlight, RC 43), both on poems by Verlaine. We may well assume that Diepenbrock played these songs (dating from, respectively, January and September 1898) to Derkinderen and that it was in reaction to his enthusiastic letter that Diepenbrock set La lune blanche to music as a memento of their meeting and as a gift to his friend. The text evokes the calm, mystic atmosphere of a moonlit night – a subject which forms the core of Diepenbrock’s output. Fauré’s setting of this poem could have been an incentive for composing this song, like it had been for Clair de lune (Moonlight). 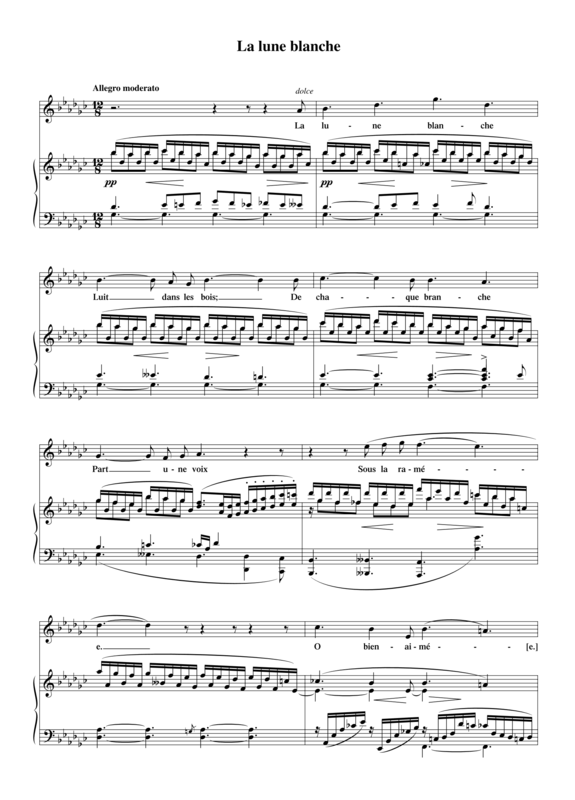 La lune blanche – rather similar in sonority to Clair de lune – is complete, but should not be classified as a finished work; on closer consideration Diepenbrock would doubtlessly have altered the parallel fifths in the right hand piano part. For this reason, La lune blanche has been placed in the Appendix of the Complete Songs.